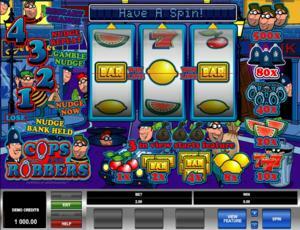 Cops and Robbers is a colorful and cheerful online video slot game from Microgaming that has been released in May 2009. This online video slot machine game has 3 reels and 1 pay line. The theme of Cops and Robbers is, well, all about cops and robbers. Considered to be one of the most specially-made slots games which resemble a pub slot more than a video slot game, Cops and Robbers is a very entertaining slot game to play at, most especially when they have included Nudge, Shifta and Hold features, which sets this one apart from other 3-reel classic slots. Most Microgaming online slot games are available in 2 formats. The first format is the one preferred by most players, which is the download format. The second format is the Flash or browser-based version, which means there is no need to download anything at all. Whether you like to download or not, Microgaming has slot games for all your slot gaming needs. Cops and Robbers is available for instant play only, so you no longer have to download anything. Give Cops and Robbers a spin and you will surely see why this classic online slots theme has been and will always be a favorite type of theme for many players who love to play online slots! One of the most well-loved themes in slots history, Cops and Robbers presents a typical bank robbery plot but with entertaining online slots action for all Microgaming players! When you first play the game, you’d be playing the role of one of the robbers in this game. You are challenged to try and steal some cash at the bank and escape the clutches of the law by playing through the Chaser Trail Bonus Feature game, where you can get extra great prizes while the cops are running, huffing and puffing behind you! You will definitely love to stay (or run) a while in the cool and amazing features of Cops and Robbers online slot game such as the Hold Feature, Nudge Feature, Nudge Bank Held Feature, Nudge Repeat Feature, Nudge Gamble Feature, Shifta Feature, Let’em Spin Feature, Hold This Reel Feature, Chaser Trail Bonus Games, and the maximum cash jackpot you can win is $5,000! The quality of the graphics and sound provided by Microgaming software is without doubt outstanding. They possess an impeccable track record of making the most impressive graphics and realistic sound effects. A lot of online slot players love Microgaming because its online slot games have smooth animation and remarkable yet non-intrusive background music and sound effects. The slot game looks a lot like a typical pub slot or fruit machine game than a video slot game, but most players don’t mind much whatever it is, because for them it truly is a very exciting slot game for something that has only 3 reels and 1 pay line! The background of the reels shows robbers trying to steal from the bank, and even going down under a manhole to escape the cops. The “O” letters in the Cops and Robbers title is cleverly designed as handcuffs. The payout list is shown on the right side and the bottom part of the reels. The background of the reels is clearly displaying the darkened setting of the slot action, which is, at the dead of the night, when people are all sound asleep on their beds. Cops and Robbers has been designed to have an authentic casino ambience with matching theme-related sound effects, which makes you more convinced that you are in a real casino playing a highly popular old-school slots game. The overall graphic design of Cops and Robbers displays main colors such as blue, purple and red. Other colors used include yellow, green and gold. Anything related to stealing and thievery requires stealth and silence, so it is no surprise that when you start playing Cops and Robbers, there will be no constant background music that you will hear. When you spin the reels, comical music will be heard. If you manage to get winning combinations, sounds of clinking coins stashed in a bag will be heard. Happy, comical music with police car sirens and whistles will fill your ears when you activate the Chaser Trail Bonus Feature game. There are no regular card deck symbols available in the Cops and Robbers online video slot game. The symbols that you will find in the Cops and Robbers slot game are the Cherry, 2-Bar, 1-Bar, Lemon, Seven, Melon, Cuffs, Cops Hat, and the Robber. There is no Scatter Symbol in the Cops and Robbers online slot game. What made Microgaming’s Cops and Robbers pretty popular unlike other 3-reel, 1-pay line slot machine games is that it has great features and bonus feature games! It has many cool features (Hold, Nudge, Nudge Bank Held, Nudge Repeat, Nudge Gamble, Shifta, Let’em Spin, Hold This Reel). It also has a fun Chaser Trail Bonus Feature game wherein the robber (you) will try to get away from the cop who is chasing him, and along the trail, you can win different features and prizes! The Hold Feature in the Cops and Robbers online slot game occurs randomly and its function is to hold the position of 1 or more reels for the next spin. When the Hold Feature is active, you will see the “Hold” buttons displayed just beneath each of the 3 reels. The Nudge Feature in the Cops and Robbers online slot game occurs randomly and its function is to allow you to bump a reel to display the next symbol. You can win up to 4 nudges per spin. The Nudge Bank Held Feature in the Cops and Robbers online slot game occurs randomly and its function is to bank your awarded reel nudges. You can win up to 4 reel nudges each spin. The amount of nudges rewarded to you is highlighted, and the Nudge buttons are enabled. The Nudge Repeat Feature in the Cops and Robbers online slot game occurs randomly and its function is that you can win the same amount of nudges used in your last spin. In the Cops and Robbers online slot game, it has a Nudge Gamble Feature wherein you can gamble your current nudges in order to win additional nudges. You can win up to 4 extra nudges. Once the Nudge Gamble Feature game is over, you are then automatically taken back to the main Cops and Robbers online slot game. The Shifta Feature in the Cops and Robbers online slot game is rewarded randomly after a spin that has no winning combination. The Let’em Spin Feature in the Cops and Robbers online slot game occurs randomly. If 2 exact same symbols are shown on the pay line after you have used up all of your nudges, the Let’em Spin Feature will activate randomly. The Hold This Reel Feature in the Cops and Robbers online slot game occurs randomly and its function is to hold the position of 1 reel for the next spin. One symbol on the 3 reels is “shaken” to let you know that you can hold this particular reel only. The reels automatically spin for you and the 2 matching symbols will come up to complete a winning combination. “Hold” wins are considered regular wins, and are paid out to you according to their payout table. You can win up to a 200x multiplier on your bet amount as well as extra cool prizes in the Chaser Trail Bonus Feature game! If you get 3 Swag Bag symbols to appear on the reels, you will activate the Chaser Trail Bonus Feature games. You advance on a Trail that is composed of game squares that contains different features. The objective of the game is to collect as many winnings as you can before the cops can catch you (Yes, you’re the robber in this slot game whether you like it or not). If you land on a mystery game square, you will activate additional features. If you get a booby prize, the game will end, and you lose all of the prizes you just got. You are free to choose to Collect a feature at any point within the bonus game (especially if you feel you’re going to be caught by the cops), or you can continue playing until you can activate features that give you a more valuable prize. Bonus You are awarded extra bonus features, at random. Boost You are boosted to a higher position on the trail, at random. Both Move Again You are awarded an extra bonus spin on the reels. Both players move on the trail. Extra Life On the Extra Life meter, all the available extra life items are filled up. Move Again You are awarded an extra bonus spin on the reels. You are the only player that is allowed to move on the trail. Restart Chance You are given the chance to re-play the bonus game again. When the current bonus game is over, you are taken back to the main Cops and Robbers online slot game, and the Repeater feature will be enabled. If the Repeater stops on Yes, you are eligible to play the bonus game again. Taxi The game squares before and after your current game square position will flash. You will move to the game square position where the flashing stopped. Feature Shots You can win extra bonus features, at random. Depending on the amount of shots you’ve won, you can re-play the bonus feature. Cops and Robbers This is a reel-based feature. You are taken back to the main Cops and Robbers online slot game. A sequence of random wins is shown on the reels consecutively. You’re awarded the sum of all wins shown. Costa Del Cash This is a reel-based feature. You are taken back to the main Cops and Robbers online slot game. The symbols will flash on after the other. You are to stop the flashing reels and stop on a symbol. The symbol you get will complete a winning combination. Doing Time This is a reel-based feature. You are taken back to the main Cops and Robbers online slot game. The reels will spin automatically. Every time a Swag Bag symbol appears on the pay line, a payout will be highlighted on the payout table. When the reels stop spinning, you will win the highest amount shown on the payout table. Ello, Ello, Ello There are 3 multiplier amounts shown. They are then concealed and shuffled. Click on the Hold button to unveil a multiplier amount. Your total wager amount is then multiplied by the multiplier amount you got. It’s a Fair Cop This is a stop-and-win feature. You stop on the flashing amounts of multipliers. Your total wager amount is multiplied by the multiplier will you get. The Repeater will reactivate the feature a (random) number of times, and you will be awarded extra bonus prize amounts. Inside Job This is a reel-based feature. You are taken back to the main Cops and Robbers online slot game. The reels will spin automatically, and you are given a winning combination at random. Nudges This awards you up to 50 nudges! Nudges collected while playing the bonus game are allocated random cash amounts. You are taken back to the main Cops and Robbers online slot game. A win equivalent to the random cash amount is nudged in automatically. Multiplier You can win up to a 200x multiplier amount. Your overall bet amount is multiplied by the multiplier amount you’ve won. Stir Crazy This is a reel-based feature. You are taken back to the main Cops and Robbers online slot game. You stop the spinning reels on a winning symbol combination. The symbol you are given will complete a winning combination. Swag or No Swag A random bonus prize amount is shown in the info window. You select to Collect or Gamble the random bonus prize amount if you want to try and win a bigger amount. You are allowed to gamble only 3 times. Whistle Blower This is a reel-based feature. You are taken back to the main Cops and Robbers online slot game. You are to stop the flashing symbols. The symbol awarded to you will complete a winning combination. Win Spins You are rewarded up to a total of 20 Free Spins! Continue? You stop the flashing. If you stop on Yes, you continue playing the bonus game. If you stop on No, the game will end and you will be taken back to the main Cops and Robbers online slot game. Carry On You spin the bonus reel and continue to play through the bonus game. Lose The game will end and you are taken back to the main Cops and Robbers online video slot game. Eliminator A single bonus item is removed from each of the bonus features for the entire duration of the bonus game. Boost You are boosted up to a random spot on the Trail. Skill Continue You are to stop the flashing letters. The aim is to complete the word CONTINUE, which gives you the chance to continue playing the bonus game. If you do not complete the word, the game ends. You will be taken back to the main Cops and Robbers online slot game. Cops and Robbers has 3 reels where you may bet on 1 pay line. The minimum bet is 0.10 and the maximum bet is 10.00 per line. You can wager 1 coin only per pay line. Thus, the minimum bet amount is 0.10 and the maximum bet amount is 10.00 per spin. The maximum payout in the main Cops and Robbers online slot machine game is a 500x bet multiplier value. Cops and Robbers does not have an Autoplay function.